As a Rancho Santa Fe resident, you know total home comfort is the ultimate luxury. But to attain and maintain this level of satisfaction you need a reliable HVAC company on your side. Well, there’s no team more committed to keeping you comfy than Mauzy Heating, Air & Solar. From our high-quality air conditioning services to our superior heating services to our innovative solar systems, you can count on our professionals to guide you toward complete comfort bliss. There’s no denying it. California’s summer temperatures can be sizzling hot. So to beat this heat, it’s crucial that your home operates a dependable air conditioner. But ensuring you never lose your cool requires a proper system installation, a quick response to repairs and thorough unit inspections. From a new air conditioning unit installation to an AC system replacement, you can count on Mauzy’s team to install your system flawlessly. Not only do our proper system installations guarantee a more energy- and cost-efficient system, but they certify chilled relief will be evenly dispersed throughout your home, too. Keep in mind, once complete contentment is attained, it must be maintained by providing your unit with the TLC it needs. So, from thorough seasonal maintenance to frequent system checkups, Mauzy’s air conditioning maintenance services in Rancho Santa Fe, CA, will ensure a sweat-free cooling season. Even more, staying on top of your air conditioner’s wellbeing will lengthen its lifespan, decrease high-energy bills, eliminate the potential of costly repairs and help save you money—all year long. However, even the most durable systems are not indestructible. 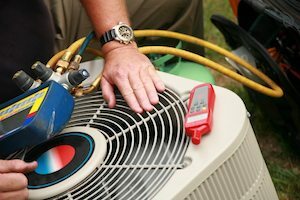 So, when your system encounters the need for an air conditioning repair in Rancho Santa Fe, CA, it’s important you restore its operation right away. In fact, the sooner you repair your system, the less likely a minor hiccup will escalate into a major catastrophe. This rings true for both your home comfort and your budget. So when you need a swift and efficient air conditioning repair, a dependable AC installation or replacement, or thorough maintenance services, you can count on Mauzy’s team to get the job done correctly the first time around. Don’t let California’s cooler weather leave your home comfort out in the cold. Instead, allow Mauzy’s team to provide the friendly and reliable HVAC services your home needs to achieve and maintain the richness of an everlasting warm oasis. With our certified technicians’ industry expertise and years of hands-on experience, the superior quality of our heating services isn’t just a promise—it’s a guarantee. From our dependable furnace installations to our swift heater repairs, you can count on our team to work endlessly to protect your home (and your unit) from catching a chill. Keep in mind that not providing your heater with the TLC it needs will cause its wellbeing to fall through the ice. So to prevent a minor hiccup—or worse, complete failure—schedule the seasonal system maintenance and frequent unit checkups your heating system needs. At Mauzy, our team has the dedication and reliable heating services to keep you snug—all winter long. At Mauzy, our team strives to find new and innovative ways to help our clients save some cash. And what we found is this: solar energy systems and residential solar panels are a more affordable way to power your home. This groundbreaking energy system transfers your home’s power reliance from the electrical company to the more environmentally friendly power option: the sun. This lifestyle change will immediately lower your energy bills and will continue to save you money for the long haul. So if you would like to see whether solar energy is right for you, feel free to contact our solar contractors today. You deserve total home comfort. With Mauzy on your side, attaining and maintaining this luxury is a breeze. For more information on how our heating, air conditioning and solar energy services can be beneficial for your Rancho Santa Fe home, fill out our online form or call our team at 858.900.3909 today!